School's out for summer...or is it? While many are enjoying their summer break, there are many college students still hitting the books and making the most of the summer semester! If you're on the hunt for books for your summer courses, Campus Book Rentals can help! You save money! By renting through Campus Book Rentals, students can save 40-90% compared to bookstore prices! For a college student on a budget, this is HUGE! Free shipping! The savings don't end at that. 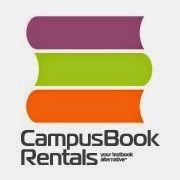 Campus Book Rentals offers free shipping. They'll ship to you at no cost, and when you send them back, it's STILL free! Both ways! They're flexible. Their rental periods are very flexible, so they are sure to work for your needs. Decided to drop a class at the last minute? They also offer a risk free 21 day return policy! And if you decide you'd like to keep a book for future reference, you have an option to buy as well! Highlighting is OK! Are you like me and like to take notes as you read? Campus Book Rentals allows highlighting, etc...but do ask that you be mindful of future renters! They give back. With each textbook rented, a donation is made to Operation Smile! You can learn more about this wonderful organization HERE. If you'd like to get started renting books for your classes...or renting your books out to other students, check out the links below to learn more! Although it seems that my son's materials are online more and more, when he does need to purchase a book they are very expensive! He has tried other services like this with some success. I'll let him know about this one too. Renting textbooks is seriously the best. I can't recommend it highly enough! I used to want to sell mine back and get some money but they honestly didn't sell high enough to make a profit comparable to just renting them!